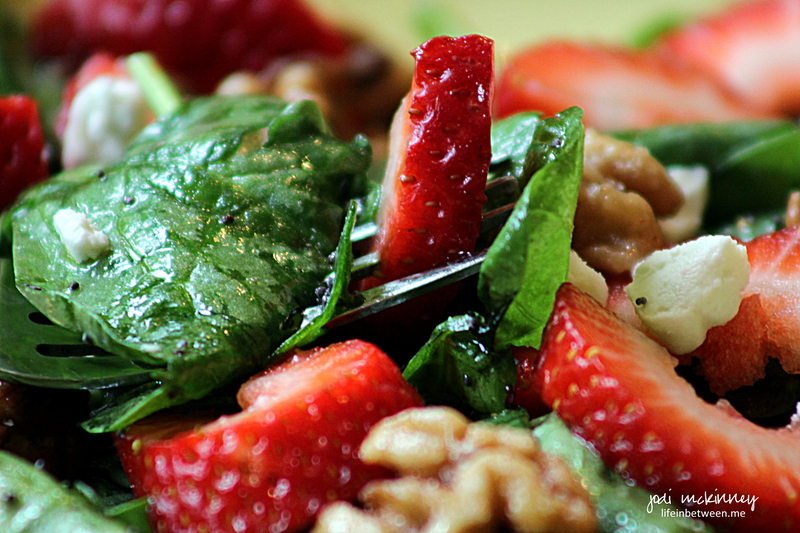 Looking for a bright, light, fresh summertime salad? 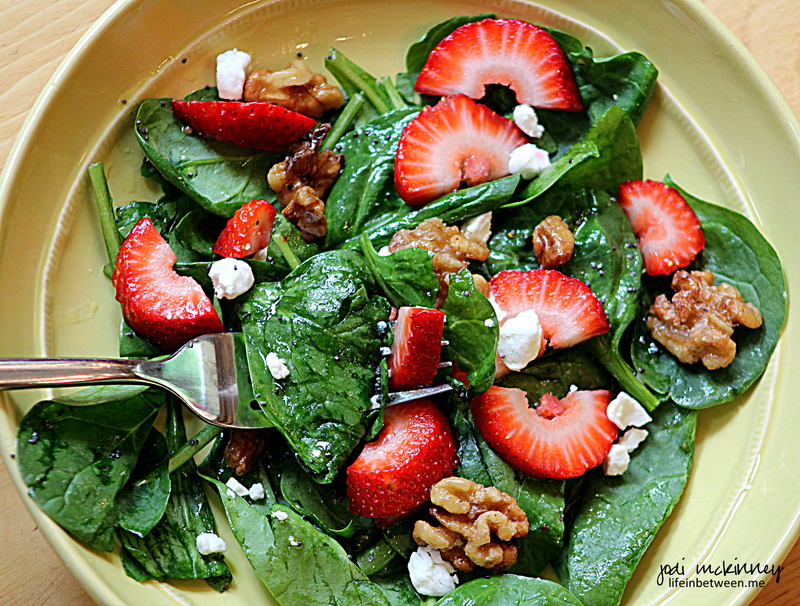 How about fresh baby spinach leaves, slices of juicy ripe strawberries, chunks of creamy goat cheese, and crunchy candied walnuts all drizzled with a sweet and tangy poppy seed viniagrette? It just screams summertime! Since we were talking about strawberries this week, I couldn’t resist making this when asked to bring a salad to Liz’s birthday party last evening. Candying the walnuts is a cinch and homemade dressing makes it so much fresher. This salad is super easy and bursting with flavor. Blanch walnuts in a small saucepan of boiling water for 3 minutes, and drain. Mix sugar and walnuts together, and spread onto baking sheet. Bake 10 minutes until golden. Whisk together vinegar and sugar until sugar is pretty much dissolved. Add in shallot powder, salt, ground mustard. When ready to serve, toss spinach leaves with poppy seed dressing thoroughly. 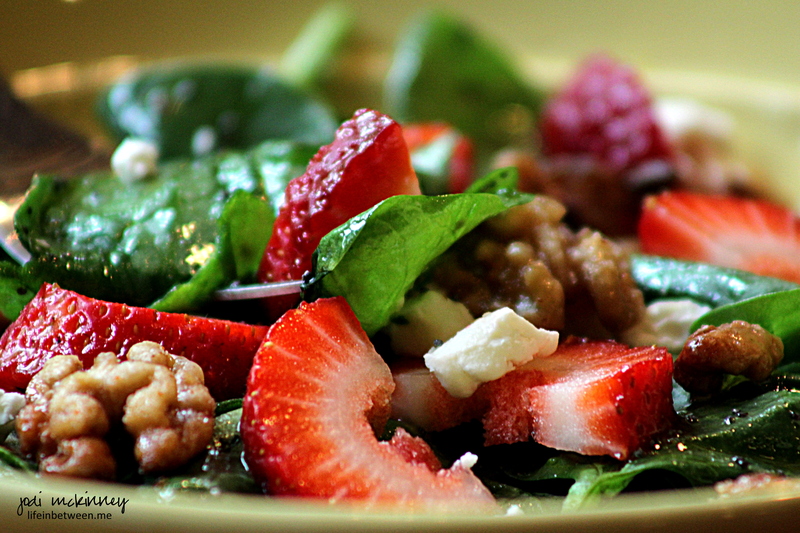 Stir in sliced strawberries, goat cheese, and candied walnuts. Happy Friday! Enjoy the weekend, and have fun doing things at life in between. Sure does look delicious Jodi! Looks like a great recipe for when you need a “special” salad. Have a great weekend! Thanks PJ! Happy Weekend to you too! This is a beautiful photo. Food photography is really very difficult and you’ve done a great job. Oh and, I’ll be right over. Oh – and c’mon over – I can whip up some more! Lucky Liz and crew to have this scrumptious salad last night. Looks delish ! Oh, delicious. This is my favorite salad! Gorgeous photos. I haven’t tried it with goat cheese yet. Dinner! Thanks Jodi. Creativity personified! 💜 Happyyyyy Fridaaaaaayyyyy! You’re BEAST at it; no wonder!! This will be today’s lunch! Thanks! Gosh–this looks and sounds delicious! Looks like something I’d get at an expensive restaurant and eat al fresco – yummo. I love fruit in my salad. This looks lovely! The Lady was buying strawberries at the greenmarket the other day, and I tried to get one, but I was not tall enough to reach the counter. 😦 Maybe this recipe will persuade Her to buy some more. Oh I hope so Albert, and I hope she shares – they are delish!